A modern general circulation model, the MITgcm, is least squares fit to all available ocean observations. This is accomplished iteratively through the adjoint method. The result is a physically realistic estimate of the ocean state. SOSE is being produced by Matthew Mazloff as part of the ECCO consortium and funded by the National Science Foundation. Computational resources are provided in part by NSF XSEDE. A biogeochemical-sea ice-ocean state estimate (B-SOSE) has been developed as part of the SOCCOM project. 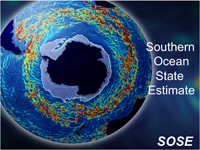 For more information on B-SOSE, see A. Verdy and M. Mazloff, 2017: A data assimilating model for estimating Southern Ocean biogeochemistry. J. Geophys. Res. Oceans., 122, doi:10.1002/2016JC012650.